The Hall is owned by The Edinburgh Merchant Company and, until recently, it was used exclusively by The Company's members. Now, this truly magnificent venue is available for use by those who wish to enjoy the beauty and prestige of The Merchants' Hall for corporate or private events. The accommodation is flexible with The Hall, The Court Room and The Crush Hall being available in any combination to suit the size of your meeting, seminar or presentation. The Merchants’ Hall offers prestige surroundings for delegates who can meet round a large oak table in the Court Room but is equally as impressive when hosting a corporate event for 200 in The Hall. You may choose from a selection of catering professionals, each of whom has a specific expertise to guarantee that superb cuisine will enhance your special occasion. 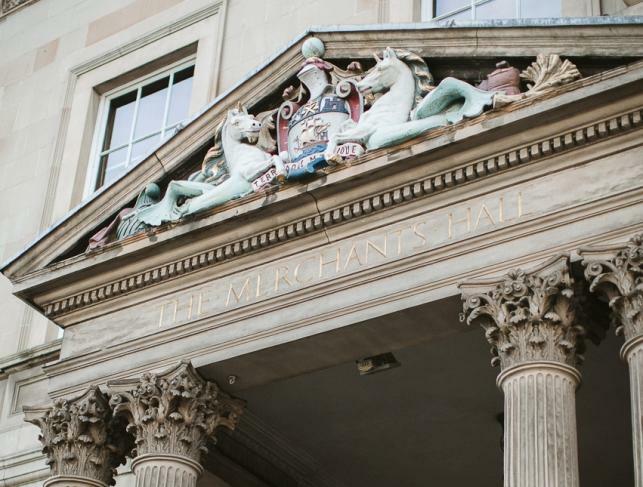 Situated in the very heart of the City of Edinburgh, The Merchants' Hall is one of Scotland's more discreet treasures, where the best of Art and Architecture have combined to create a building of grace and distinction that includes a Minstrel's Gallery. Situated on the first floor with views of Edinburgh’s famous Princes Street and up to St. Giles Cathedral, The Court Room is suitable for private lunches and dinners for up to 50 people. It also provides an excellent venue for board meetings and seminars.